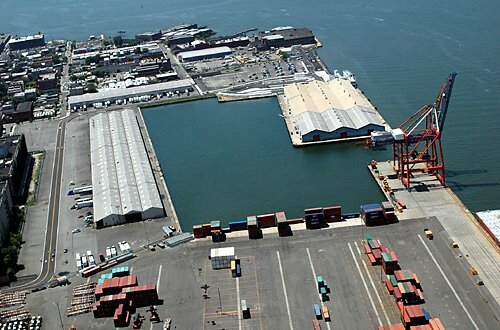 The New York City Economic Development Corporation (EDC) has just put out an RFP (Request for Proposals) for an operator for 100% of the Pier 11 shed, a structure that lies along the Eastern edge of the Atlantic Basin on the Red Hook waterfront (on the left of the photo, above). 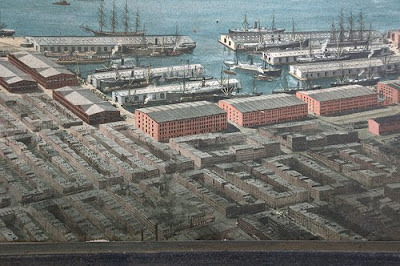 A portion of this shed and surrounding site, including 600 feet of Atlantic Basin water frontage, was supposed to be the home of PortSide NewYork and their ship, the Mary A. Whalen, which they use for their cultural, educational and community outreach programs. 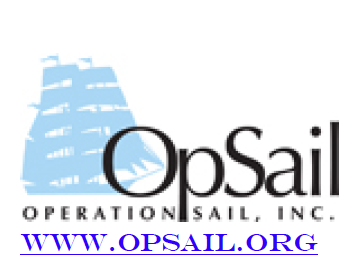 PortSide is now looking for a new home as they have been kicked out of the Atlantic Basin and the EDC's promise to allow them to make a permanent home at this site has been withdrawn. The EDC, through the new RFP, is asking for a respondent (developer) to sub-lease the site to operate and develop "cargo industrial warehousing and distribution operations". You can see and download the RFP here. 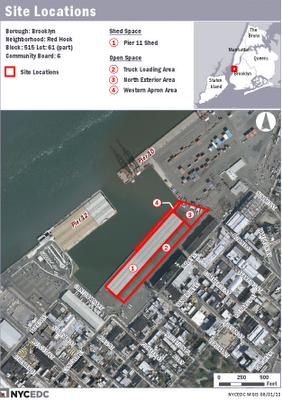 The creation of this RFP must mean that Phoenix Beverages, the beer trucking company that currently uses the Pier 11 shed for recycling and garbage, will be moving out of that site and consolidating their entire operations at Pier 7, at the bottom of Atlantic Avenue. This is where most of their activities already take place. UPDATE (10/10/12): The Red Hook Star Review (story HERE) confirms that Phoenix Beverages will consolidate their operations at Pier 7. The Star Review story, however, makes no mention of PortSide's inauspicious removal from the plans for the Pier 11 shed and Atlantic Basin, nor the fact that the EDC's new RFP excludes ANY community use, public space, waterfront access at the site, as was promised. It would seem like an obvious and logical move to accommodate Phoenix at a single location - in fact, many of us have been advocating for this for a while. The main reason Phoenix (a.k.a. Long Feng Trucking) trucks have been a problem for our neighborhoods is because of the EDC's insistence, when the final and contentious deal was done in 2009, that Phoenix split their operations between Pier 7 (bottom of Atlantic Ave) and Pier 11(bottom of Pioneer Street), which meant that their trucks had to shuttle through local streets between the two locations, noisily rattling and racing through Red Hook and Columbia Street's residential neighborhoods, imperiling pedestrians along the way. This problem was "solved" when community uproar about broken promises (my post here), which were made to keep the trucks on "internal roads" within the container terminal, forced politicians to step in and, with the co-operation of the Teamsters, the Phoenix truck drivers were directed to use the BQE to get from one end of the neighborhood to the other. If the comments on this blog are anything to go by, trucks re-routing along the often congested BQE regularly costs the drivers up to 30 additional minutes (without overtime pay) at the end of their work day - something I bet they'll be happy to be rid of, when (or if) this consolidation at Pier 7 does take place. But that doesn't mean we'll have fewer trucks coming in and out of the Pier 11/ Atlantic Basin location. Unfortunately, the RFP - calling for 100% of the shed to be used for "cargo industrial warehousing and distribution operations" - will mean MORE trucks for this site. 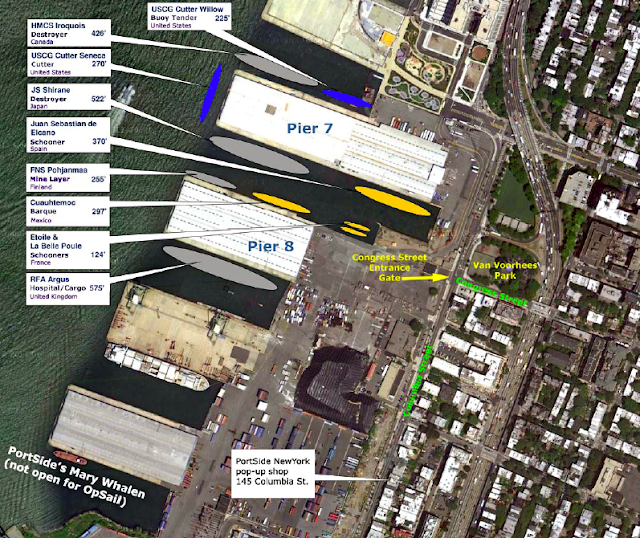 If what we suspect is happening, Phoenix's 200+ truck trips a day will come in and out of their Pier 7 location (Atlantic Ave), and the operations of the new "developer" at Pier 11 will bring additional truck trips in and out of the Red Hook location (as of yet unknown in weight, size, number and type), entering and exiting on Bowne Street, feeding out into our neighborhoods and onto our streets. That doesn't sound like what we were promised back in 2009. 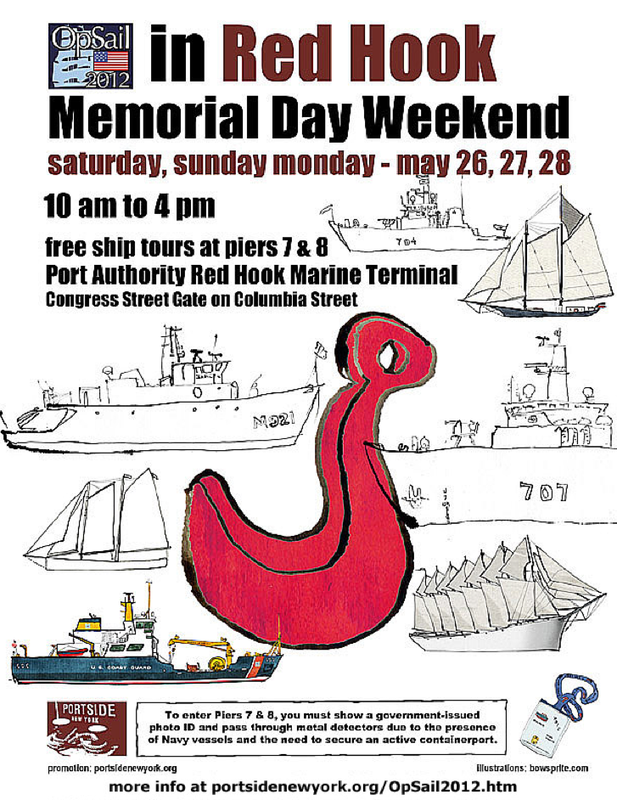 You see, one of the assurances made to our community when the deal was done to move Phoenix to the Red Hook waterfront - and, inexplicably into BOTH Piers 7 and 11 (when they only ever wanted one pier) - was that, when Phoenix moved in to Pier 11, a portion of the shed and the surrounding site around the Atlantic Basin would be allocated for community, cultural use, public and open space, accommodation of the Brooklyn Greenway, waterfront access, transportation, etc. It must be remembered that previous EDC plans, Community Board 6 guidelines for the development of Piers 7-12, and Red Hook's own 197a Plan, have all called for industrial maritime use to be maintained on the waterfront, but also called for the creation of community-friendly elements - we're talking open space, public access to the water, cultural and educational uses, and better waterborne public transportation. In 2007, when the Red Hook Container Terminal secured its lease to remain on the Red Hook waterfront, that lease fulfilled the requirement for significant maritime-industrial use of the piers. 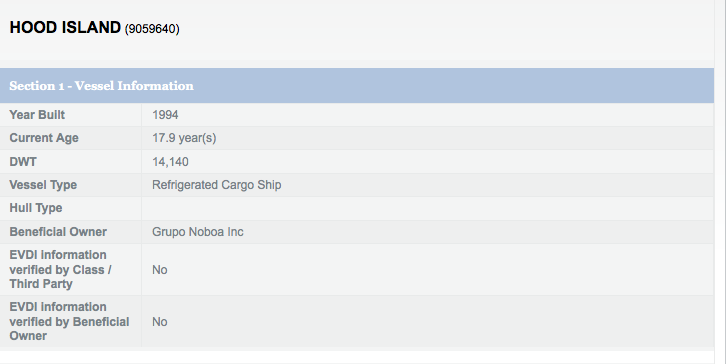 The Container Terminal retained Piers 7, 8, 9, 9a and 10. After that lease was signed, the only remaining parcel of property that could possibly be used to fulfill the other needs - those for the community-friendly elements - was the Atlantic Basin and the Pier 11 shed. That was all that was left! That's why, in 2009 when we found out that the EDC wanted to also "take over" the Pier 11 shed (and the Atlantic Basin) by leasing it to Phoenix Beverages, the community was in full revolt. In an attempt to placate community concerns about the Phoenix plan - including questions about congestion, pollution, appropriate use of precious, publicly-owned waterfront land, etc. 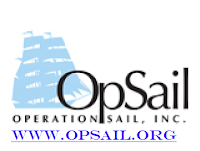 - the local non-profit organization, PortSide New York, was tapped by the EDC to take on the task of making the "community-friendly elements" a reality, using part of the shed and a 600 foot length of the Atlantic Basin. At the time I wrote it was a "small concession", but at least it was something! Representatives from the EDC, including Vice Presidents Venetia Lannon and Andrew Genn, assured us at meeting after meeting that PortSide was an integral part of the whole deal, and we were told we shouldn't worry about being shut out or cut off from the waterfront to which our community - both residential and commercial - was craving more connection. That's what we were promised. Well, that promise was broken. Initially, things seemed to be heading in the right direction. 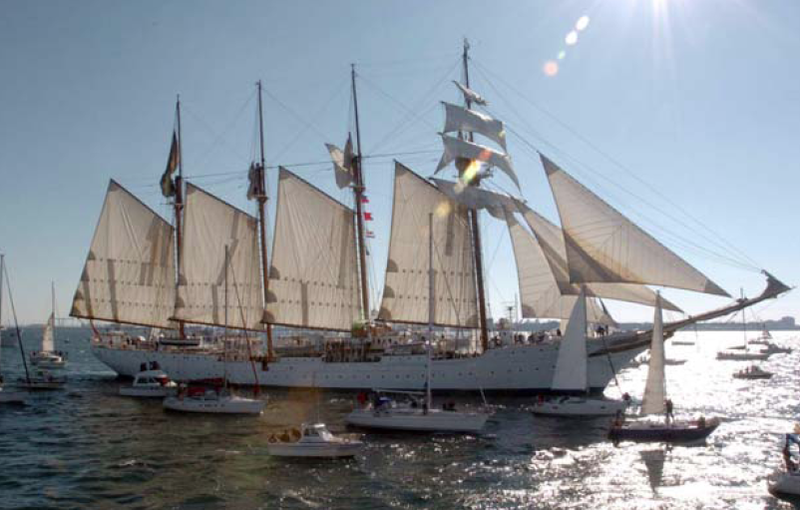 Since 2009, PortSide has been given the opportunity to create a few very successful events in the Atlantic Basin using temporary, short-term permits. 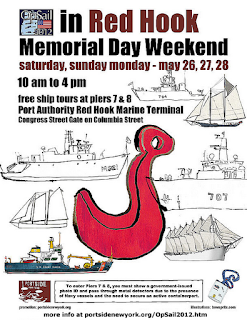 There were "Tanker Concerts" (pic below) in collaboration with with local venue, "Jalopy", the Dutch Flat Bottomed Boats event (pic above), community sailing trips with tall ship, Clipper City, and more. 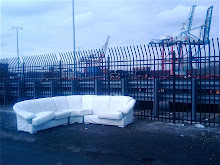 But, earlier this year, PortSide were inauspiciously kicked out, ridiculed by the Port Authority as being like a "gypsy" camping out at "Terminal 2 at JFK" ... and now, they are looking for a new home - possibly, at great loss to our community, outside of Brooklyn. To add insult to injury, we see now that the EDC is not even looking for a replacement for PortSide. They want to take over the whole site for warehousing and industrial use. There is no mention of the community-friendly elements - not even accommodation of the long and carefully planned Brooklyn Greenway! Why are they ignoring the clearly articulated needs of our community? This goes against all of the rhetoric previously coming out of government and the community itself. Time after time - in Red Hook's 197a Plan, to the 2003 and 2006 Community Board 6 Guidelines for the development of Piers 7-12, in statements from local representatives, Red Hook Civic Association, the EDC and even the Port Authority themselves - the consensus has been that our mixed use neighborhood needed more access to the waterfront, more public space, waterborne transportation, connection of local businesses to the waterfront - what everyone called a "balanced" use of the waterfront. Even recent studies, including efforts supported by the City, have called for more "balanced use of the waterfront". The Vision 2020 NYC Comprehensive Waterfront Plan, which was hashed out in 2010, stated that the area around the Atlantic Basin and the adjacent cruise terminal should be assessed for further "public use", "active water related public use", "proper alignment of Brooklyn Greenway", "recreational and educational programming" (my post here). If the EDC is looking for someone to develop 100% of the Pier 11 shed for industrial use and warehousing, doesn't that torpedo any possibility of realizing these community-friendly elements? Can someone tell me, what was the point of that whole Vision 2020 thing?!! *More public waterborne transportation - East River Ferry, perhaps? ..... and the list goes on! Yet again, the EDC is letting our community down. Depriving us of meaningful access to our publicly owned waterfront. Making bad decisions that impact our community with trucks and pollution - I haven't even mentioned the EDC's role in bringing unmitigated, polluting cruise ships to our residential neighborhood, spreading asthma-inducing emissions over our kids' heads and into their lungs (an evil notorious enough to have a cameo in Spike Lee's new movie, "Red Hook Summer"), and the EDC's role in sending relentlessly noisy helicopters into our air space. I really don't know what the EDC is thinking - but shouldn't we let them know a few of our thoughts? I thought I'd post the Port Authority's press release regarding the approval of the shore power plan for the Brooklyn Cruise Terminal. It seems like the situation with the shortfall in funds - the sticking point in making this plan a reality - was resolved by the Empire State Development Corporation, which shifted some funds from the New York ports dredging commitment to the shore power plan. The press release also states that Governor Cuomo had a hand in making this all work, and if that means that he is aware of the importance of investment in this sort of life-saving and environmentaly friendly technology to our city, its ports and our residents, that's a very good thing. He goes further, stating, "The Port Authority has a long-standing and unwavering commitment to safeguarding the environment in the communities that host our facilities and across the bi-state region we serve." "The facts are, according to the Environmental Defense Fund (via this article from John Kaltenstein, Friends of the Earth) the yearly operations of the Ports of NY and NJ (Ed Note - i.e. 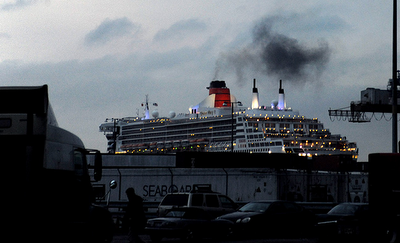 the ships visiting the ports) create as much pollution as 7.8 million cars. That's 7,000+ tons of NOx (nitrogen oxides), nearly 5,000 tons of SO2 (sulfur dioxide) and 600 tons of Particulate Mater (PM)." "Ships create 91% of the SO2, 47% of the NOx, and 62% of the particulates the operations of the port produces - that's information from the Port Authority. 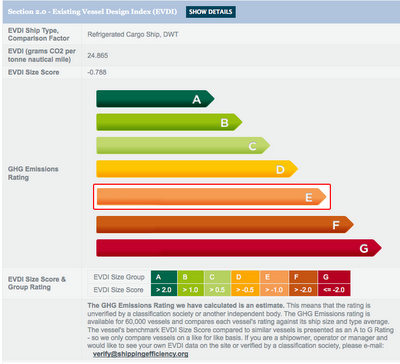 Trucks that service the ports also contribute significant percentages of these substances, with 25% of the NOx, 12% of PM and 37% of CO2." It was clear, at that time, that the Port Authority was hardly coming clean on this stuff. My point was that until the Port Authority acknowledged the contribution that the activities of their ports had in creating this dangerous pollution, how could they ever meaningfully address it? And they have been slow to do anything in the way of shore power - Brooklyn will be the first - and even in getting a comprehensive "clean truck" program up and running, we're dawdling. 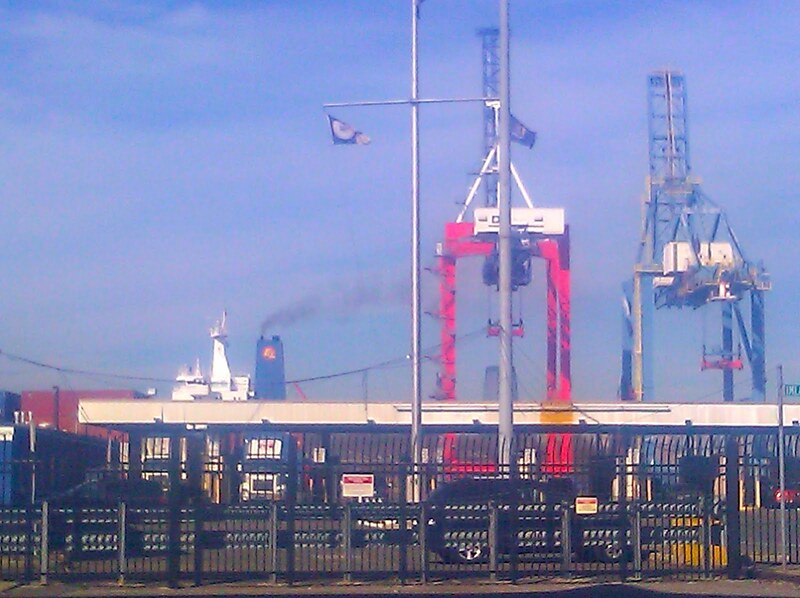 The truth is that this city and its agencies are way behind their West Coast counterparts on "green port" matters. Even regarding this shore power plan for the cruise ships visiting the Brooklyn Terminal, when the Port Authority came to our community in 2009 and told us that they were going to get this plan up and running - after years of community activism calling for this life saving technology to be used at the new "state of the art" terminal in Red Hook - the PA spokesperson, when asked, said that he'd only know about shore power for "a couple of years". Now, this is a technology that has been used by the US Navy for over 50 years, has been increasingly implemented on the West Coast after its first use more than a decade ago, and has been available in many other countries around the world. For someone representing an entity called the Port Authority to make this statement was astounding to me. Anyway - all of that history aside - these statements from Mr. Foye are pleasing and seem to show increased acknowledgement of the impacts of port pollution on our residents and of the Port Authority's responsibility to address and reduce those negative health impacts. As I've said many times, this Brooklyn plan should be the first step in implementing this type of life saving technology throughout our ports. We have the 3rd largest port complex in the country, outside of Long Beach and Los Angeles. In those West Coast ports, much has been done with these technologies, with all types of ships - cruise, container, etc. They've seen the value in it. 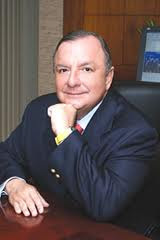 The Mayor of Long Beach, Bob Foster, stated that plugging a large container ship in to shore-power "takes enough pollution out of the air to equal 33,000 cars”. That's a huge reduction in carcinogenic and asthma inducing emissions, not to mention green house gases. So, there's still lots to be done here, in New York. Perhaps the recent statements from the Port Authority acknowledge that. If so, hopefully the Brooklyn Cruise Terminal will be the first of many, similar shore power berths around our city. One thing's for sure - this is a good start. Construction of the East Coast’s first shore power port facility will move forward toward a 2014 completion following today’s action by the Port Authority’s Board of Commissioners. The project will create 30 jobs and result in $22 million in economic activity. At its monthly meeting, the Board authorized additional funds provided by the Empire State Development Corporation needed to complete the $19.3 million shore power port facility. The project will allow cruise ships serving the Brooklyn Cruise Terminal to plug in to a more environmentally friendly electrical landside power source rather than operating on their diesel generated power while at the dock. Ships serving the Brooklyn Cruise Terminal are typically in port for up to 11 hours loading and unloading passengers and supplies. While docked, the ship’s power is supplied by auxiliary engines on board the vessel, which are typically powered by high sulfur diesel fuel. The use of shore power will allow two ships calling on the Brooklyn Cruise Terminal - Queen Mary 2, and Caribbean Princess - to connect to an electrical grid on the dock and turn off their engines. The environmental benefits include an annual reduction of 1,500 tons of carbon dioxide, 95 tons of nitrous oxide, and 6.5 tons of particulate matter. Funding for the project includes $12.1 million from the Port Authority, a $2.9 million grant from the U.S. Environmental Protection Agency. On Tuesday, the Empire State Development Corporation voted to allocate $4.3 million from the Port Authority’s Bistate Dredging commitment to New York State to the shore power project. In addition, Princess and Cunard will spend up to $4 million to retrofit its ships. The New York Power Authority will supply electricity to the cruise lines at a fixed and discounted rate for a period of five years, which is valued at roughly $2 million per year. The Brooklyn Cruise Terminal is owned by the Port Authority and managed by the New York City Economic Development Corporation. Port Authority's Shore Power Question: Is It Worth Spending $4M to Save Brooklyn Residents $9M Per Year in Health Costs? The Port Authority of New York and New Jersey acts in mysterious ways. 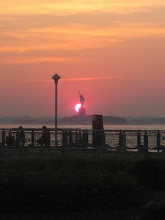 I found that out a few years back when I attended a Port Authority Board Meeting that was deliberating the expansion of the Red Hook Container Terminal and the relocation of Phoenix Beverages to the Brooklyn waterfront. Phoenix were being given use of Pier 11 on the Atlantic Basin as well as Pier 7 at the bottom of Atlantic Avenue. The meeting called for public comment, but, as the meeting progressed, I realized that my comments and those of others in our community - many who wished to express their worries about pollution, congestion, and the exclusion of meaningful public access - would only be allowed after the board had already made its decision. After the gavel had come down. Literally (my post here). It was weird, to say the least, and obviously frustrating considering the matter on which they were supposedly "deliberating" was one that involved publicly owned land (as is the case with all Port Authority controlled land), and considering the PA itself is a public entity. Since then I've realized that the Port Authority has also been willing to throw sand in the gears of many proposed people-friendly improvements to the use of Red Hook's waterfront. In 2009, when PortSide New York and the New York Economic Development Corporation facilitated the visit of tens of historic "Dutch Flat Bottomed Boats" to our neighborhood, creating a mass mooring in the Atlantic Basin and providing a great event for the visiting vessels as well as for our community, my family and I walked to the end of Pioneer Street, through to the gates in the mesh fence to Pier 11, where the the continuing road meets the water, and we joined the hundreds of people who jumped at the opportunity to visit this "blue space", the historic Atlantic Basin - the protected harbor that is nestled behind the cruise terminal - which is an underutilized neighborhood treasure (my post here). After talking to a few of the Dutch captains, however, it was clear that the Port Authority had been quite an obstacle in the planning of this unique gathering. One captain described arduous red tape, the changing requirements and conditions to be met that almost scuttled the whole event. No wonder we haven't seen anything like it since. 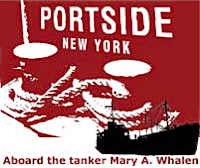 Not only that, we've seen PortSide and its vessel, the Mary A. Whalen, being thrown out of their promised home on the Atlantic Basin and Pier 11, with the Port Authority hardly being helpful with accommodating them temporarily, or allowing them the opportunity to raise funds to remain operational. It's hard to get people interested in your venture when your ship is only accessible to Port Authority authorized personnel, on Port Authority restricted property, and only 5 at a time! 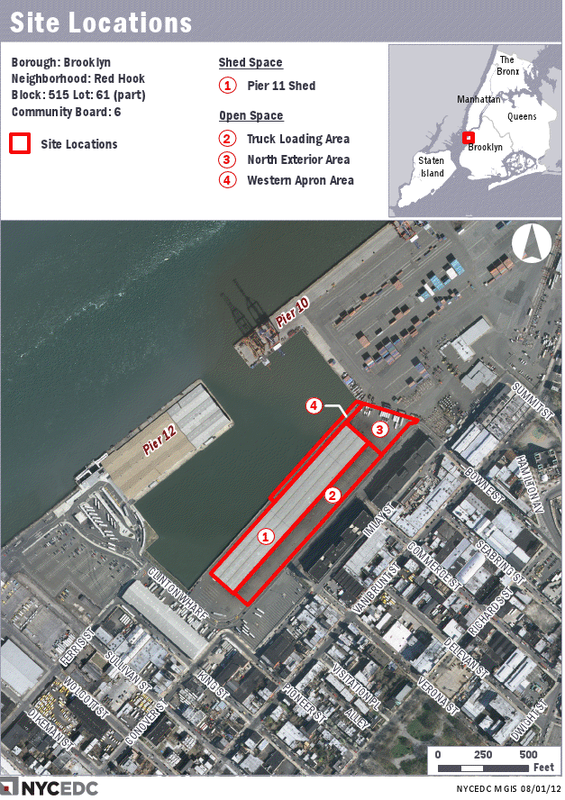 A Port Authority spokesperson actually compared PortSide's presence at the Red Hook piers to "having a gypsy camp at Terminal 2 at JFK Airport " - nice! And then there's the plan to bring shore power to the Brooklyn Cruise Terminal. Under the leadership of Chris Ward, the Port Authority had committed funds to create the infrastructure required to allow for this life saving practice to become operational at the Red Hook terminal. Mr. Ward, in testimony given to the Public Service Commission, cited a study that prompted this statement: "We estimate that the annual health benefits emissions reductions arising from a switch from on board generation to shore power at the BCT, adjusted for Kings County, approaches $9 Million" (full statement here, my post here). In other words, as things are right now, the annual monetized health cost to Brooklyn residents of these cruise ships is estimated to be $9 million. There were many similar statements from supporters of this plan, all calling attention to the environmental and health benefits it would bring. However, there were a lot of pieces that needed to fall into place to make this happen, and, finally, this time last year the announcement was made that the deal was done - with the participation of, and commitment from the Port Authority, the Environmental Protection Agency, the NYCEDC, the New York Power Authority, Carnival Cruises and the support of every representative of our community - shore power would be coming to Brooklyn in 2012. And since then we've been waiting. What's the hold up? Well, after a while, hearing no news and seeing no physical evidence of anything happening at the terminal, I started getting a little nervous. I asked someone who was close to one of our 'electeds' if we had anything to worry about. That person's take was that the deal was secure - unless there was a change in leadership at the Port Authority. And then, in October last year, Chris Ward left the Port Authority. A few weeks back, there was the troubling news that that the Port Authority was balking at the revised cost of creating the shore power infrastructure at the terminal. They had okayed the original investment, but were questioning the extra amount that would be required. Yes, the Port Authority is having budget problems, but on that matter they're talking about numbers in the billions of dollars. So to quibble over this relatively small amount, when the savings are so obvious and precious (we're talking about our kids here) - and knowing that the added investment pays for itself in 6 months - it seems very short sighted to be delaying this plan. Our representatives in government agree, and many of them, according to recent articles in the Brooklyn Eagle, and the Daily News, have written to the Port Authority urging them to make good on their commitment to see this plan through to completion. Those representatives include Congresswoman Nydia Velazquez, Borough President Marty Markowitz, State Senator Daniel Squadron, Assemblywoman Joan Millman, Council members Brad Lander and Sara Gonzalez. They all agree - the Port Authority should get this done. In these matters, the Port Authority is truly dawdling. And concerning in the plan in Brooklyn, which has been described as a "no-brainer", do they really need more convincing? 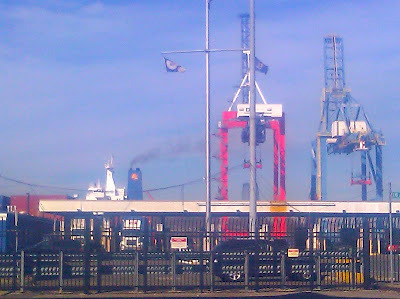 Ships stop idling in port - you know, "Idle-Free NYC"? Huge reduction or elimination* of soot or "black carbon"
Reduction of cancer, lung disease, heart disease, premature death, etc. * These substances will be eliminated if the electricity is supplied by "green" sources. In the case of the Brooklyn plan, the power would be supplied by the NY Power Authority which generates a significant proportion of its electricity from Niagara Falls hydroelectric - emissions free! So - c'mon Port Authority. Make good on your commitment. Keep your promise to our community. Let's finally make the Brooklyn Cruise Terminal idle-free. As anyone who visits this blog regularly knows, I've had quite a hiatus from writing over the last 6 months or so. This is partially due to the events last year that secured a deal that guarantees the implementation of the use of shore-power at the Brooklyn Cruise Terminal. This plan should be up and running this year, 2012, and will allow the visiting cruise ships to turn off their idling engines and reduce the pollution and health impacts they have on our waterfront neighborhoods and their residents. This had been one of the primary issues addressed in this blog, along with waterfront development, transportation and environmental justice, so I guess the resolution* of this matter gave me a reason to slow down a bit. Additionally, my work life hasn't allowed me to spend as much time as I'd like at the computer writing on the important issues that effect our neighborhood. Despite this, I have been watching closely and trying to get information out about local issues, and I hope anyone who is interested in them follows me on Twitter - @viewfromthehook (see the end of this post for some recent stories you might have missed). The events surrounding the recent Costa Concordia cruise ship disaster, however, have spurred me back to action and back to the computer keyboard to write again about the issue of ship pollution. Apart from the terrible human tragedy that has unfolded over the last weeks, the Costa Concordia disaster has the potential to be a terrible environmental tragedy as well. At the time of the ship running aground, it had only been at sea for a few short hours, and, as a result, was carrying a full load, according to this article (here) from Marcie Keever at Friends of the Earth, (700,000 gallons) of fuel, for its journey. That fuel - the fuel that powers most large ocean going vessels (cruise and container ships) - has been the villainous subject of this blog ever since its inception. That fuel is "bunker fuel". Bunker fuel is, as Ben Goldfarb describes in this recent article (here), the "viscous, bottom-of-the-barrel residue of petroleum distillation, tar too thick to be burned by any vehicle other than an enormous ship." The shame of this is that this extra-dirty fuel is not only the source of harmful pollution as it is heated up, to make it less viscous, and then burned to power the diesel engines of large ships such as the Costa Concordia and the other cruise and container ships that ply the waters of the globe - which also idle constantly while visiting our ports. It is also that this fuel's very potent and viscous qualities would make for a huge environmental disaster if it leaked out into the pristine waters surrounding Giglio Island, off the Tuscan coast of Italy, where the Costa Concordia now rests. 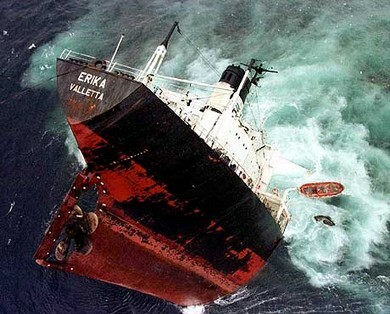 In 1999, in one of the worst environmental disasters from a bunker fuel spill, the "Erika", a tanker that was carrying 30,000 tonnes of bunker fuel, broke up in a storm and sank in the Bay of Biscay, off the Atlantic Coast of Brittany, France. The amount of fuel that was spilled was approximately 19,000 tonnes, and the ship sank between 30 and 50 miles off shore. The spill initially created a 10 mile long slick and, eventually, on-shore pollution that resulted in an oily layer up to 1 foot thick along the shores of the Loire River where it meets the coast, approximately 80 miles away. According to the web site of "Cedre", the Centre of Documentation, Research and Experimentation on Accidental Water Pollution, "a viscous oil layer, 5 to 30 cm thick and several metres wide, covered parts of the shoreline." Apart from the huge impact on seabirds, seals, shellfish and even salt production, much of the damage to sea life in the ocean and on the sea floor was not visible. But, as you can imagine, this was a massive environmental tragedy - one that France considers to be its worst environmental disaster which, according to this story at Guano Island blog, "polluted 400 km (250 miles) of coastline and caused damage valued at up to 1 billion euros ($1.30 billion)". It eventually cost the negligent ship-owners, who apparently were aware that the tanker was not seaworthy, $280 Million in compensation. This disaster also lead to the implementation of regulations that required oil tankers to have double layer hulls that would reduce the risk of such environmentally devastating spills. Most importantly, this event has made clear the terrible impact such a spill would have if it ever happened gain. Now, according to "Cedre", the Costa Concordia is only carrying a tenth of the quantity of bunker fuel (2,400 tonnes) compared to the "Erika" (which was not only being fueled by the substance, but transporting it as well). However, the cruise ship is right on the shoreline and is moving with the currents with the potential for its bunkers to rupture and spill the contained fuel, literally feet from shore and in pristine and protected waters. If that leak occurred, the damage to the eco-system and the shoreline would be dramatic, not to mention the damage to the economic health of the whole area (simulation here). Thankfully, the authorities are doing everything they can to ensure that this potential environmental and economic disaster never eventuates, and many of us around the globe are hoping for that positive outcome. However, this disaster is another reminder of the unpalatable and harmful nature of this substance - bunker fuel - that propels the world's ocean going vessels, pollutes our air, harms our children's health and potentially damages our environment. "the ongoing use of bunker fuel is also one of the most appalling public health scandals in the world. Bunker fuel, when burned, produces an olio of airborne chemicals, including sulfur oxide, that have been linked with acid rain, asthma, and lung infections. In 2009 James Corbett, a University of Delaware expert on ship emissions, calculated that 64,000 residents of port cities die every year of bunker fuel-related ailments; in 2012, Corbett predicted, that number will rise to 87,000." The not-so-good news is that for the foreseeable future this bunker fuel will continue to be burned in-port and at sea by the container ships visiting the Brooklyn Container Terminal, and by every other cruise and container ship visiting our city, and in much of our country. That is apart from some ports and waters of the West Coast where a lot of work has been done over the last decade to implement such pollution-reducing and life-saving practices as the use of shore power - also called "cold ironing" - while the ships are in port. There are regulations coming into effect over the next number of years that will reduce the amount of sulfur in the fuels that can be burned by ships using North American waters and using our ports. But, make no mistake, the fuel that will be used by these ships in the future will still be some of the dirtiest diesel on the planet - with Sulfur levels hundreds of times higher than is present (or legal) in the diesel used by trucks or trains, as opposed to the thousand times higher Sulfur levels that are present in the fuel currently used by ships. So, even though there will be an improvement in the level of pollution that these ships emit while cruising the world's oceans and transporting our goods, if they're not using shore power when they're in port, the ships will still be idling, burning extra-dirty diesel and emitting harmful substances into our neighborhoods' air, compromising the health of our residents. Additionally, they'll be buying and adding to our reliance on imported fossil fuels, adding to greenhouse gasses, creating soot or black carbon, and adding to the bottom line of already prospering multinational oil companies, instead of purchasing much cleaner electricity from our local, domestic utility companies, thereby helping our local economies. This doesn't make sense - and it's unnecessary. For my part, the Costa Concordia disaster is another reminder of what the real-life risks and impacts of shipping are, and the choices that we have to make to improve this industry's impacts. I'm not anti-cruise ships, per se. I'm not anti-industry - at all. It just seems to make sense that these industries should not be making their (sometimes minimally taxed) billions at the expense of the environment or the health of our residents, particularly our most vulnerable. The recent ship wreck on the Tuscan coast, like the one that created the environmental disaster in the sea off Brittany in 1999, is a reminder that we don't want bunker fuel - this noxious, bottom-of-the-barrel, viscous substance - ruining our environment and degrading our quality of life. Whether it be as a result of a spill - coating the beaches of Brittany, the Mediterranean coast, the wings of seabirds or acres of unseen ocean bed - or whether it's being heated up and burned to power berthed ships, idling constantly at the edge of dense residential neighborhoods, with the resultant, yet avoidable, carcinogenic and asthma-exacerbating emissions being pumped into the air of our cities and into the lungs of our children, there is no place for this substance and its emissions in our environment. 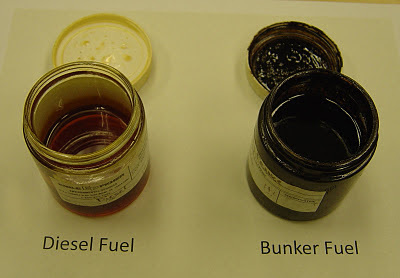 It's time to say good-bye, and good riddance, to bunker fuel.